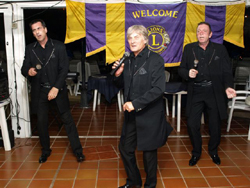 Saturday 15th October saw Santiago Del Teide Lions Club celebrating their President´s Night, with a magnificent Buffet Dinner and Cabaret evening at El Marques in Puerto Santiago. Invited guests were Deputy Mayor Inocencio Doble and his wife Remedios and Legal Advisor to the Council, Antonio Espinosa and his wife Alexandra. The evening was a huge success, with 89 guests in attendance. 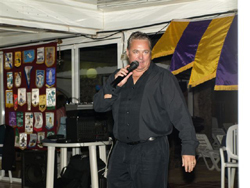 Entertainment was provided by artist and showman Gavin Nicholas, who had many of the audience in tears of laughter and music to get everyone dancing came from the superb saxophonist, guitarist and singer, Stu McCoy. It was a perfect evening for departing President, Steve Gilbert to hand the reigns to incoming President, Ken Ward. 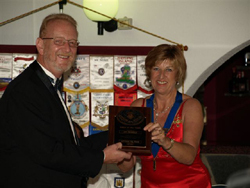 Apart from the traditional welcome to all guests, Steve Gilbert was delighted to award the coveted “Lion of the Year” plaque to Terry Hill for his unstinting support and dedication to the work we do. During the evening, brief speeches were made by Steve Gilbert, Ken Ward, Inocencio Doble and John Brookhouse from Las Rosas. All were thanked for giving us such fantastic support and Inocencio Doble was pleased to announce, that after the 20th November General Election in Spain, the Ayuntamiento will be giving the Lions Club use of a local in Puerto Santiago. This will be set up as a store where people can donate unwanted items, that can then be sold on to generate more income to assist many local families experiencing difficulty in these harsh economic times. 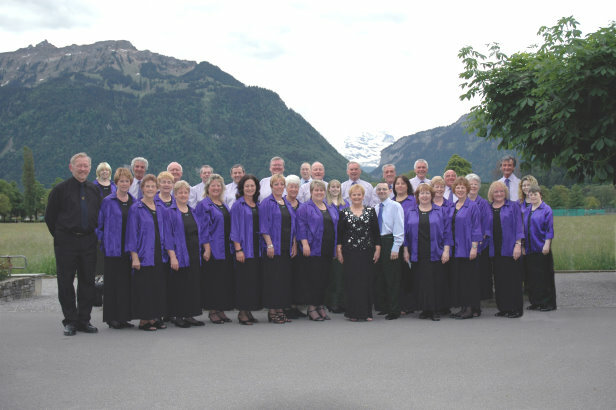 It was announced by Steve Gilbert that during the last year, the Lions Club has raised 5,600 euros to put into their Food Voucher Scheme. It is hoped that with this new source of generating income, we will be able to support many more local people in need. Deputy Mayor, Inocencio Doble addressed everyone in Spanish to give his personal thanks for all the help we were able to offer. His speech was ably translated by Jamie Gilbert, much to the relief of the majority of the audience. 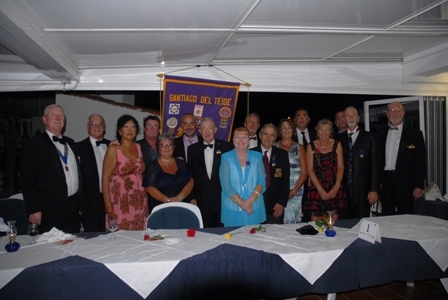 All guests agreed that the evening represented tremendous value at only 30 euros per head and many are now eager to attend the next event, which is scheduled to be Charter Night in the early part of next year. Ana Martin, Resort Manager for EL marques, was warmly thanked for the excellent service of all her staff in making this evening such a success and once again demonstrated that this venue provides a superb setting for this type of occasion.